Status Instruments has launched a new Exd flameproof connection head, developed for use in potentially explosive environments and certificated to either IECEx or Atex standards. Status’ SCH50 series is manufactured from aluminium and finished in a blue epoxy paint, or stainless steel.The connection head has been designed to house the company’s SEM200, 300 and TTR series of temperature transmitters as well as ceramic connection blocks. Sealed to IP68, the SCH50 can be specified with base or side entries as well as a display window option which allows the process value to be displayed when used with Status’ DM700HM/XI loop powered indicator. 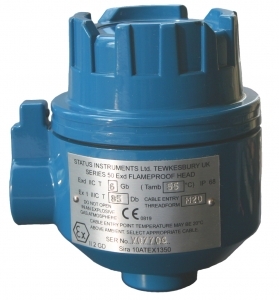 All versions of the connection head come with a flameproof collar and temperature probes specifically designed to suit Exd applications can be supplied. Approval to either IECEx or Atex can be specified along with size entry size at the time of ordering. ‘Flameproof’ protection is the most widely used method of protection for electrical apparatus in hazardous areas. Standards require that the apparatus enclosure is of sufficient strength and integrity to withstand an internal explosion of the hazard for which it was designed, without the explosion setting fire to the surrounding atmosphere.